Painting van murals in the garage of his parents’ home 40 years ago, Bobby Wiltshire began his lifelong love and passion for art. While continuing his artwork in 1976 at Kings Dominion Theme Park on the beautiful carousel, he was told that every male employee was advised by their superior to shave their faces. No more mustaches! A life-long mustache-wearing guy, Bobby decided it wasn’t worth it! It was then he was approached by Busch Gardens in Williamsburg to restore and repaint their carousel horses. Thus, Carousel Signs and Designs was born. After the carousel project was completed, Carousel began producing redwood sandblasted monument signs for the housing and apartment communities in the Richmond area. Carousel was the first in the area to use redwood in their sign production. Since that time, Carousel has enlisted a variety of mediums for sign-making and the business has continued to create designs, letter vehicles (computer generated nowadays), and make signs for clients not only in the housing and apartment industry but for businesses up and down the East Coast. Ultimately, it’s his love of art that drives our business. Bobby has never lost his zeal for creating art and making customers happy! In the year 2000, Bobby’s daughter, Jamie, gave him a watercolor set with which he began to paint. He has taken classes through the Visual Arts Center with Shelly Bechtel Shepard and at Crossroads Art Center with Christopher Wynn. Empowered with his experience and skills, he has become a successful watercolor artist. His paintings realistically reflect the atmosphere a day presents, including representations of rural Virginia and his favorite place to visit, the Outer Banks of North Carolina. To see more of Bobby’s art, visit his website,www.bobbywiltshire.com. You can also see some of his artwork at Crossroads Art Center in Richmond, Virginia. 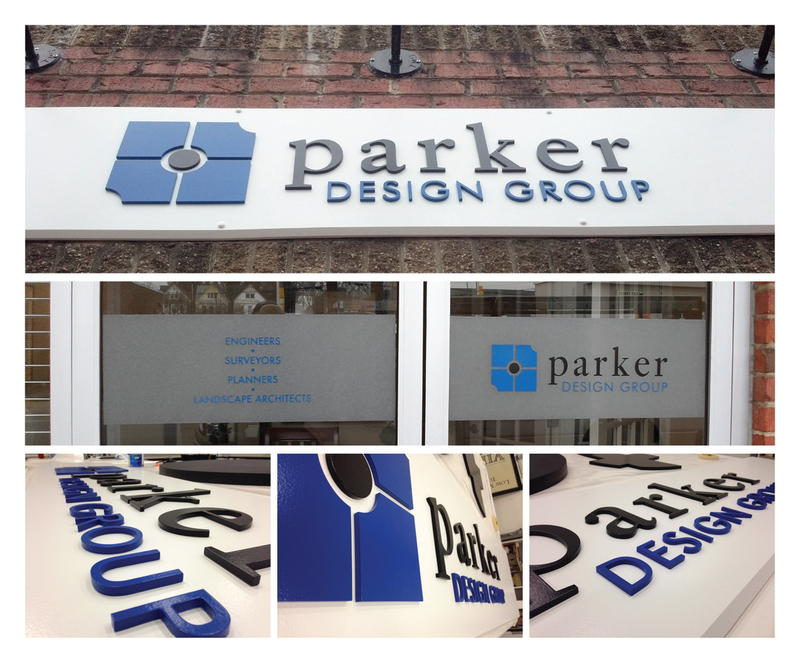 We recently completed a sign and vinyl project for Parker Design Group. They are a full-service civil engineering firm with offices in Salem and Richmond, Virginia. Their work can be seen all along the Mid-Atlantic region, from McDonalds Restaurant developments to residential communities. Parker Design Group is a forward thinking company that stays on top of the ever changing technology trends. Whether it is design, planning or surveying, their approach to presentation is top of the line. For their signage, we decided that less would be more. Signage would reflect their vision of “presentation first.” We established that a routed sign would give a 3-dimensional look that better represented this multifaceted company. We mounted it on a light background to help the company name and logo pop. They also wanted some vinyl accents for their doors. We used a frosted vinyl material, which we then printed with their logo and a listing of some of the services they offer. For the vinyl we decided that a long strip extending across both doors would aesthetically relate to and mimic the rectangular sign above. When creating signs for our clients our number one goal is to exceed their expectations. We want to best represent our clients with a professionally built custom sign. Our work with Parker design is a mirror of their standards of quality.